Despite the advent of second wave feminism in the late 1960s, it took more than twenty years before feminist literary criticism started to pay attention to the complex role of women Beat writers. Merely Being There Is Not Enough theorizes the memoirs of Diane di Prima, Joyce Johnson, Hettie Jones, and Brenda Frazer, and analyzes their contributions to the Beat movement. Among the writings of female Beat authors, the memoir has become the most commonly used literary genre. At the height of the Beat movement, Frazer published Troia: Mexican Memoirs in 1969, the same year that saw the publication of di Prima’s Memoirs of a Beatnik . 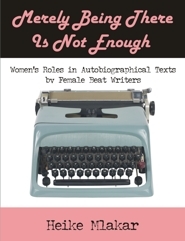 Most female Beat voices, however, remained astonishingly silent until 1983, when Johnson published Minor Characters: A Young Woman’s Coming of Age in the Beat Generation . Johnson’s long-time friend Jones followed with How I Became Hettie Jones in 1990. The memoirs of Beat women chronicle the Beat-1950s and the intimate relationships with icons of the time: Jack Kerouac, Allen Ginsberg, LeRoi Jones/Amiri Baraka, and Ray Bremser. Being there at a crucial moment in history validates female Beats’ stories as indispensable social documents of the 1950s. To make women Beat writers visible and to categorize their memoirs, this work immerses in the almost paradoxical project of defining a category of female Beat writing when it is the nature of Beat literature and its rebellious aesthetics to dismiss any kind of labeling. Women Beats unsettle the categories of Beat writing and culture: Therefore, a revision and re-examination of Beat history is inevitable to understand the movement’s literary expression. Heike Mlakar earned a Ph.D. in American Studies at the Karl Franzens University Graz/Austria. Her major field of study is U.S. postwar literature with a special focus on the Beat Generation.